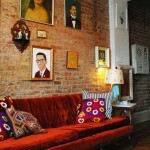 Beautiful, glamorous and lush tufted sofa inspiration. Loving this pastel purple tufted sofa that blends in seamlessly into the neutralness of this room! Elegant and chic tufted sofas in grey velvet. Beautiful color scheme in purple, grey and yellow. Gorgeous tufted sofas in green. and in a brighter green velvet set in a Moroccan styled interior. 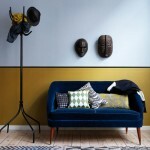 A yellow tufted sofa in a modern, urban interior. Mustard yellow tufted settee in a contemporary setting. This entry was posted on Thursday, July 12th, 2012 at 8:21 am	and is filed under Couch, Decorating, Grey, Purple, Yellow. You can follow any comments to this entry through the RSS 2.0 feed. You can leave a comment, or trackback.